Many hip hop dance groups have entered the spotlight recently through the television shows America's Got Talent and Britain's Got Talent. Diversity Dance Group and Flava are just two of the dance crews that have hit the scene recently on these popular television shows. Hip hop dance groups traditionally have performed on the street and other impromptu settings. Movies like Step Up: The Streets make an impression on those who are unfamiliar with the hip hop dance culture. Movies such as this attempt to show the 'real' hip hop culture-the culture that is unknown to those who are not inside it. 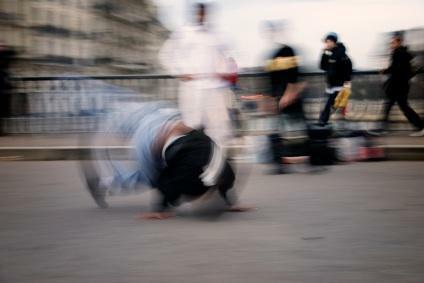 This street culture is different from the hip hop dancers that take the stage in hip hop competitions and on television shows like America's Got Talent and perform versions of hip hop moves. Hip hop dancers form groups to perform onstage, but these are usually different from the hip hop groups that form naturally in urban city centers. These groups, usually called 'crews,' enter competitions on an informal basis, and battle each other on the streets or in other meeting spots. The hip hop groups that exist in this domain seldom enter the national dance spotlight, but the groups performing on television or in national and/or international competitions are readily available to the public. These 'stage' hip hop groups have websites where information about their members and performances can be found, and some of their routines can be viewed on video websites such as YouTube. Some famous groups can be seen all over the Internet, and have appeared on television in recent seasons of the television shows featuring dancers and other performers. Winners of the 2008 Hip Hop Championships, the Philippine All-Stars group has a flawless way of performing as a hip hop group. This is one of the difficult aspects of being in a hip hop group, as compared to individual hip hop dancers, and this group pulls it off very well. Their semi-final routine at the championships received a five-star rating on YouTube, and their routine in the final won them first place in the competition. They also won the competition in 2006, making for an impressive track record for a group that was only founded in 2005. Their goal is to elevate the status of dancing in the Philippines; the current situation, in which dancers are considered second-rate performance artists, is something this group hopes to help change. Flava appeared on Britain's Got Talent, met at first glance by skepticism from the judges, but were wildly loved by the crowd from the very first moment. Flava's style is a good example of a hip hop group performing onstage, with choreographed numbers, but implementing some of the tricks and surprises into the routine that might normally be seen in street hip hop competitions. Though most street hip hop is not choreographed, Flava's choreographed routines still exude a distinctly authentic flavor. Also appearing on Britain's Got Talent, Diversity dance group was one of the biggest hits of the 2009 season of the show. Their performances proved to not only have a significant amount of merit as choreographed dance numbers with a distinct hip hop style, but they also managed to bring unique elements to their performance. Their two youngest members were a kind of 'hidden secret' in their acts and one of the audience's favorite elements of their routines. Making a big impression at the 2007 hip hop dance world championships, Black Time is a group whose outfits more closely resemble what one would see a hip hop crew on the streets of an urban neighborhood wearing. While their routines are still choreographed, the choreography and style of the group somehow are closer to that of true street hip hop. All of these hip hop groups feature excellent dancers. As hip hop becomes more and more popular with the mainstream viewers of all sorts of different dance performances, hip hop is becoming less and less of a street dance, and more and more of a dance performance to be learned in dance classes.